Description: Peru. Early miniature map with Latin text on verso. Decorative cartouche. Coloured. Description: Peru. Rare Michael Sparke edition with English descriptive text on verso. Coloured. Description: Peru. Decorative cartouche, compass rose and sailing ships. Original colour. 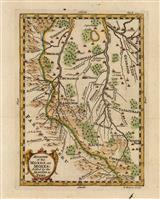 Description: Coloured map of Peru from the Dutch Golden Age of the 17th century orientated east to west. 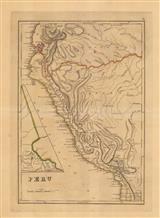 Description: Modern Peru, Bolivia, and Ecuador, as well as the course of the Amazon as it was known. Dutch edition published by F. Halma. Vivid original hand colour. 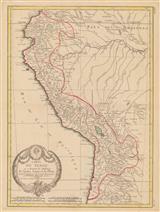 Description: Southern Peru, from Lima to San Pedro de Atacama, now in northern Chile. Original colour. Description: Plan of Lima showing the city as it appeared before its destruction by the great earthquake of 1746. An index of important buildings is included on the right. Coloured. Description: Mission of the Moxos, settled by the Jesuits. Coloured. Description: Quito Province in Peru. Original hand colour. 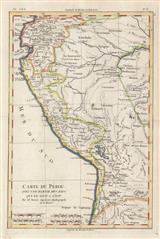 Description: This map shows the main seat of Spanish power in South America, Lima. In modern geography the countries shown are Ecuador, Peru and Bolivia. Original hand colour. Description: Peru. Shows national distance measures. Coloured. Description: Peru. Striking, large detailed map. Original colour. Description: Peru. Original outline colour. Description: Peru. Borders with historical text. Original colour. Description: Peru and Bolivia. Original colour.